Wondering what a Feuerzangenbowle is? Had several translations on offer from the internet, but as this is something purely German, translations offer little meaning. Well, it is a heavy drink, put together by mostly red wine and rum, and other little seasonings. Try h2g2 website where you find a complete definition of this drink along with the recipe and much more. Anyway, the city of Nuremberg has put up the biggest Feuerzangenbowle of the year. A special kettle had to be built to hold 9000 liters, 2,50 meters in width, 3,40 meters in height and it weighs 1,8 tons. 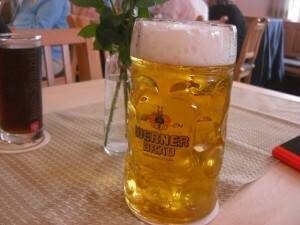 The Feuerzangenbowle can be viewed and tasted from 25 Nov 2011 until 01 Jan 2012. This drink, consumed from the time of advent until New Year’s Eve, is supposed to warm your heart and soul during the cold winter months. 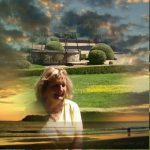 To view photos, visit Frankenradar. Every so often, the botanical term Waldmeister comes up in a lesson. Initially, most students see some kind of relationship between the Waldmeister (Master of the woods) and the school’s Hausmeister. 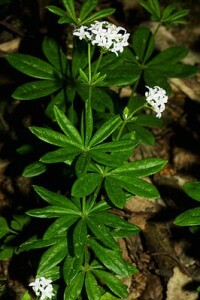 But Waldmeister is an herb (sweet woodruff) and mostly found in Central and Northern Europe, as well as Western Siberia. 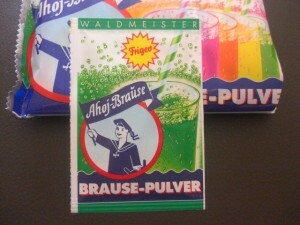 We used to love this Brause-Pulver (sherbet powder) as kids. We made fizzy lemonades or just poured the powder into our hands and licked it off, as is, dirty hands and all. I was very surprised to find it on the German supermarket shelves, after all these years!